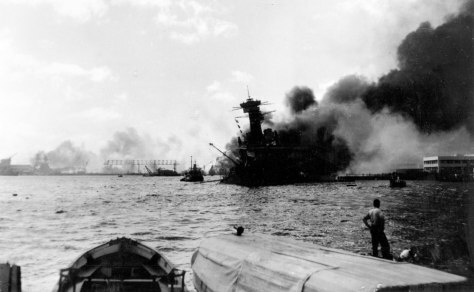 The battleship USS California is afire and listing to port in the Japanese aerial attack on Pearl Harbor, Hawaii, on Dec. 7, 1941. Durrell Connor, who coded and decoded messages for the Navy, was aboard the USS California when it sank in Pearl Harbor during the attack. Connor will return with 17 family members to remember those who died in the Japanese attack 69 years ago during the Pearl Harbor Anniversary.